Green building isn’t a fad. Green building doesn’t mean living “off the grid” and going dumpster diving to build your home (not that there’s anything wrong with that). Green building is simply a way to build a home that’s healthier, more comfortable, and more efficient. And in the long run, a green built home is less expensive to boot. As homebuilders and homeowners, we have an opportunity to have a significant positive impact on our environment. Single family residences are responsible for a high percentage of the energy and resources consumed in the United States. John Marshall Custom Homes, Inc. is committed to building homes in an environmentally responsible way. We implement this commitment by building homes under the ENERGY STAR and LEED programs. All of our new homes built since 2007 have been ENERGY STAR certified. We were one of the first area homebuilders to make this committment. We are proud to offer new homes that have earned the ENERGY STAR® label. ENERGY STAR qualified new homes are substantially more energy efficient than homes built to the minimum code requirements. Our ENERGY STAR qualified new homes are independently verified by a third-party Home Energy Rater to ensure they meet ENERGY STAR energy efficiency guidelines. These homes are better for the environment and better for you. Learn more about ENERGY STAR qualified new homes at http://www.energystar.gov/. We have been building our houses utilizing green building principles for several years. Now, as a natural evolution of our committment to the environment, all of our new homes will carry a Green Building certification. 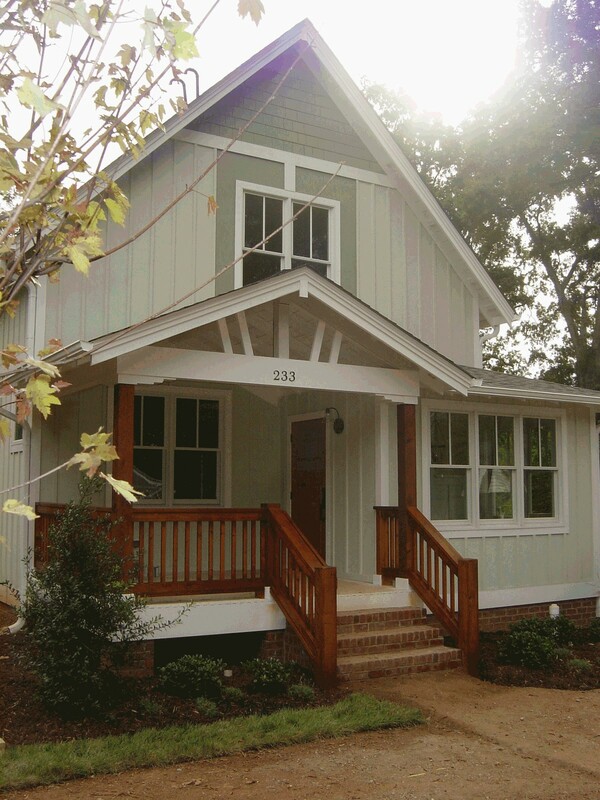 In 2009, John Marshall Custom Homes completed a home at 233 Catawba Avenue that is the first home in Davidson to be certified under the LEED for Homes program administered by the U.S. Green Building Council. This home was also the first home to ever receive a gold level or higher certification in Mecklenburg County. In 2011, we received certification on our 2nd LEED home, which was built in Davidson Springs at 631 James Alexander Way. Since then, several more of our new homes have received LEED certification, with several more in the pipeline. We are one of the leading builders of LEED certified homes in all of North Carolina. As of January 2018, we’ve certified 20 homes in the LEED program, with a half dozen more currently in the review cycle. Green building remains something of a mystery to many people. Quite simply, green building utilizes good construction techniques to build homes that are energy efficient, minimize resource consumption, have healthy indoor environments, and are respectful of their impact on the global environment. Following is an overview of some basic green building principles. We are happy to provide you with additional materials upon request, and to discuss how can benefit from your project being green. While not always possible, the most environmentally friendly approach to building is to use infill sites. Infill simply means to “fill in” areas of existing neighborhoods. Our Davidson Springs neighborhood is a great example of an infill project. Davidson Springs is surrounded by existing neighborhoods, and is serviced by existing sewer and water mains. Thus, relatively few resources were expended to develop this neighborhood. Great American cities such as Charleston, Savannah, Boston, Washington, D.C. and others were designed to maximize community and minimize suburban sprawl (these cities were designed before the suburb even came into being). Lots are relatively compact, but the houses are well designed for privacy and aesthetics, and there is easy access to public places such as parks. Our Davidson Springs neighborhood was designed with these concepts in mind. Lots are compact. Houses are elegant, and within the houses are many private spaces. But, the large front porches and nearby community parks encourage interaction with neighbors and a true sense of community. The benefit of good neighborhood design on the environment is quite simple. If you build 4 houses to an acre instead of 2 houses per acre you cut in half the amount of land required for new construction. Much of the loss of open space in Mecklenburg County is directly attributable to large suburban neighborhoods with large lots and big, cul-de-sac heavy street layouts. By contrast, an infill site with compact lots such as Davidson Springs does not result in any suburban sprawl. Green building begins even before the first footing is dug. Good house design is critical to green building. The home’s orientation and the placement of windows is vital to passive solar heating which helps keep your home warm in the winter without running the furnace. Awnings and roof overhangs minimize the glare of the sun in the heat of summer, thereby reducing the workload of the A/C system. A green house does not have to be a small house, but good design will result in a smaller house. For example, a well designed house may meet a family’s needs with 2500 square feet of living space, whereas a poorly designed house might require 3500 square feet to provide the same functionality. The smaller home is obviously more resource efficient in both the near term and long term. Green building does not mean that all components of a home are recycled, nor does it require you to scavenge dumpsters to find your materials. But it does require common sense in how materials are selected and utilized. The choice of floor framing materials is a great example. In addition to being more consistent, strong and versatile, I-joists are more environmentally friendly than 2×10 dimensional lumber because they utilize smaller trees and portions of trees that might otherwise go to waste. In addition to choice of materials, the utilization of materials is important. For example, centralized cutting areas result in less waste. Taking time to accurately order materials is another simple component of green building that keeps costs and waste down. Building an energy efficient house is one of the key components of green building. Building an energy efficient house not only saves on your power bill, it also has a global impact in that efficient houses consume less electricity which in turn results in less coal being burned, less mountaintops blown off to get the coal, and less carbon being released into the atmosphere. Building a house to ENERGY STAR levels is a no-brainer, which is why John Marshall Custom Homes has been doing it for several years. ENERGY STAR requires good home design, use of efficient materials, and the creation of a tight building envelope. Window placement and overhangs are just some of the elements of design that result in an efficient home. Highly efficient HVAC systems, windows and tankless water heaters are some examples of efficient materials. A tight building envelope is created by using housewrap and by air sealing the house from the inside. Studies have shown that some of the unhealthiest air is found inside your home. Part of the reason for unhealthy air is that homes have gotten tighter, but what goes in the home hasn’t changed. Many materials such as carpets, paints and cabinets have adhesives that “off-gas”, or release volatile chemicals into the air. These chemicals then become trapped inside the house. The crawl space has typically been a storing house for dirty air which then gets pulled into the house via the HVAC system. A simple approach to a healthy indoor environment is to select materials that are considered low or zero VOC (volatile organic chemicals). These materials off-gas much less than their unhealthy counterparts. Conditioned crawl spaces are another element of a healthy house. Creating a clean, conditioned environment beneath the house results in healthier air circulating through the house, not to mention greatly reducing the possibility of having mold issues. The global impact of building green, efficient and healthy houses is tremendous. Fewer resources are utilized, less greenhouse gases are released into the atmosphere, and healthier enviroments result in healthier people. Green building does not have to be expensive. Yes, it is more costly than building a house on the cheap, but over the long haul a well-built home is less expensive to operate and maintain than a poorly built home. You don’t have to spend five figures on solar panels or geothermal heat pump systems in order to have a green house. Insist on a green built home. Whether we build your house or someone else does, going the green building route is better for all of us.